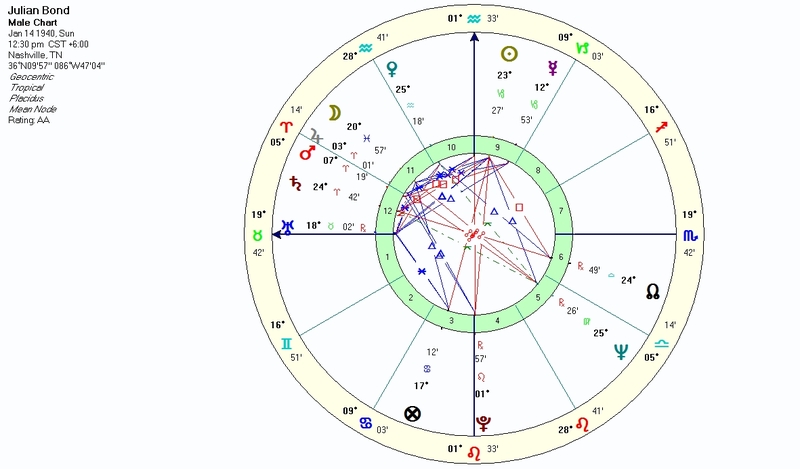 I woke this morning (16 Aug 2015) to the new that the civil rights leader Julian Bond had died yesterday and it occurred to me to look at his natal chart to see if this event had been foreshadowed in the stars of his birth. Fortunately, we have a reliable record of his birth with data from his birth certificate: 14 Jan 1940, 12:30 pm CST, Nashville, TN, Rodden rating AA. Here is the birth chart. The houses related to the death of the native are the 8th of death and the 4th of final endings and the grave. The 8th is ruled by Jupiter and the 4th by the Sun, with Pluto closely conjunct the 4th cusp. Since he died at age 75, I wondered whether Pluto on the 4th cusp would have reached the ASC by primary direction at age 75.